A concerned citizen told authorities about the issue and deputies took the horses to a local veterinarian. 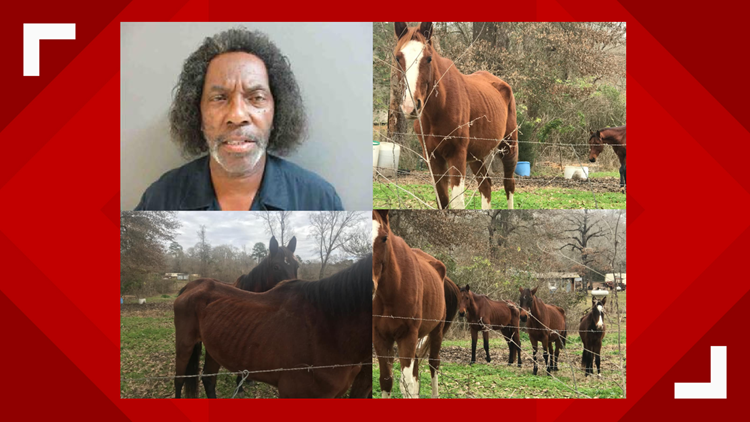 HOUSTON COUNTY, Texas — The Houston County Sheriff's Office has arrested a Houston man on multiple counts of animal cruelty after several malnourished horses were discovered earlier this month. According to the HCSO, deputies arrested Ralph R. Jones on five counts of animal cruelty. Authorities seized the horses, who were visibly malnourished, from a property in the Ratcliff area on Friday, January 11, after receiving a call from a concerned citizen. The animals were taken to a local veterinarian for treatment. The horses will be released later this week to a certified rescue.